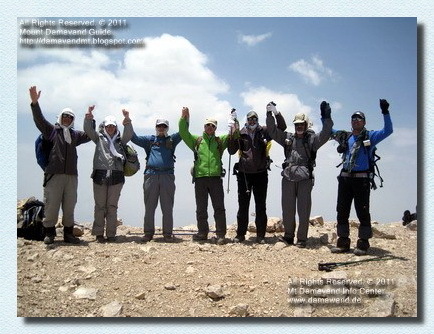 Mount Dena is located in the Zagros Mountain Range South West of Iran. This mountain chain is about 70 Km long and has about 50 peaks above 4000 meters. The highest peak of Dena Mountain is called Bizhan 3 or Ghash Mastan (Ghachmastan) and it is 4535 meters high. 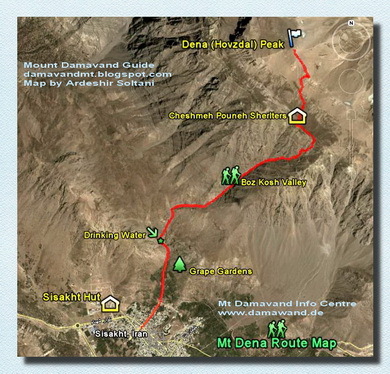 Dena is situated between three Iranian provinces, Isfahan, Kohgiluyeh Boyer-Ahmad and Chaharmahal Bakhtiari. - Bizhan III (Ghash Mastan) 4435 m, the highest peak. Central Hovz Dall (also called Dena peak) is the most popular peak of the mountain for hiking trekking and mountaineering. 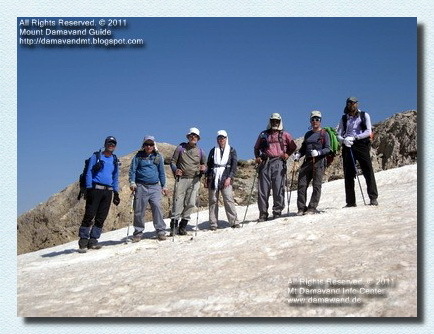 The route for this peak passes through the beautiful Boz Kosh Valley on the south face of the mountain. This route has a shelter/refuge called Cheshme Pouneh (or Cheshmeh Pidani) at altitude 3800 m, about 1.5 to 2 hours before the summit. Sisakht Town is about 35 km from Yasuj City and is the favorite starting point to reach Mt Dena. Yasuj City> Sisakht Town> Sisakht Resort. Sisakht Resort> Boz Kosh Valley> Cheshme Pouneh Shelter> Hovz Dal Summit. Trail path distance from Sisakht to Cheshme Pouneh Shelter: 6100 meters. Trail path distance from Sisakht to Hovzdal Central Peak: 7800 meters.